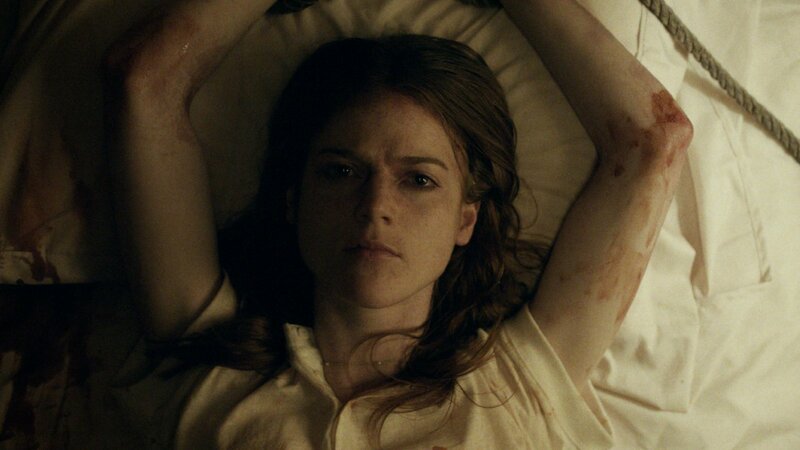 As her first try at directing and co-writing (with Phil Graziadei) a movie, Leigh Janiak, shown in the photo below, has come up with a little "weirdity" called HONEYMOON. While I wish it were better, I will not decimate it in the manner of the guest I brought along ("I can't remember a more complete waste of time.") nor in the words of the lady who rode down in the elevator with us ("I want my 87 minutes back!"). 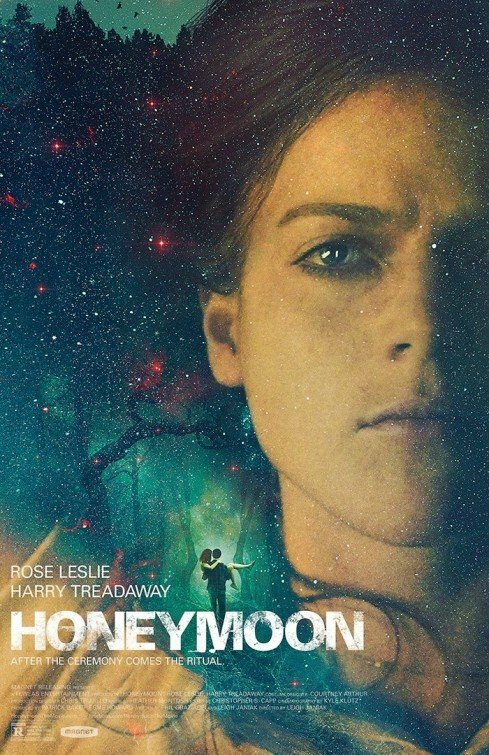 As we need more women at the helm of today's movies, however, it pains me to have to say that Honeymoon is pretty much a waste of time. While the first half of the film is at least tolerable (though the cutesy, lovey-dovey honeymoon-couple interplay between its stars Rose Leslie (bottom, below) and Harry Treadaway (top, below) at times comes a little too close to setting the teeth on edge), by the end of the enterprise, it is clear that Ms Janiak has missed the boat in just about every conceivable way. Did she want to give us a straight-out horror movie about alien possession of one of this newlywed pair? Is this more a sci-fi/fantasy? Is there some deeper man-woman/feminist-patriarchal significance playing out around the edges? Perhaps "yes" to all three, yet nothing here works well enough to make us give a hoot. Withholding information and then offering up enough to make us want to continue is key in movies like this one. But Janiak withholds as though this were all we needed. And for far too long. Really, couldn't she and Mr. Graziadei have come up with something a bit better than a white light shining into the newlyweds' bedroom, hovering over their faces (without waking them up?). This is neither scary nor very intelligent. Once the pair have demonstrated that something bad is happening to our heroine, they simply leave it at that. It is soon quite apparent where this whole thing is going, so any suspense quickly drains out of the tale. It remains creepy, however, mostly thanks to the low-grade-but-effective special effects. There is one very good and gruesome scene toward the finale -- this is probably what induced the film's distributor, Magnet Releasing, to take a chance on it -- the "money shot" of the horror genre, so to speak. But I fear this will not prove enticing enough for word of mouth to properly spread. Mr Treadaway, who, along with his brother Luke, is one of the more handsome young actors around, with a face you just want to keep watching. He has the better role here, for he is allowed a good deal of variation. Poor Ms Leslie, once she has become prey, is pretty much one-note throughout and not a lot of fun or even of much interest, as wife or monster. Proper foreshadowing is provided by another couple we meet along the way (played by Ben Huber and Hanna Brown). Otherwise, this one's a two-hander, until, at last, it loses one of those hands. Honeymoon opens this Friday, September 12, in New York City (at the Cinema Village) and Los Angeles (at the Sundance Sunset Cinemas). Click here to view a few other playdates, with cities and theaters.